Potato Chips- Homemade and delicious! Potato Chips- In my maternal home arrival of summer starts with making sun dried items and pickles. 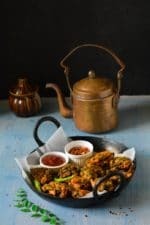 I have so many fond memories of my childhood summer afternoons spent helping my grandmother and mother in making different types of frymes, papad and vadis. They both are experts in making these home made aloo papad and aloo chips .Our big terrace was fully covered with so many muslin sarees on which Aloo papad , sabudana papad and Moong daal vadies are spread to dry in the heat and then in the evening we again go to the terrace to turn the semi dried papads and often while making Aloo Papad the feast begins from the starting, where me and my sisters will start eating the yummy spiced up potato mash while making the papads and then start eating the semi dry papad when we go to turn all the papads in late afternoons . Sun dried Potato chips are made in two patterns ,one is plain sliced and one is with the crisscross pattern . For making the crisscross pattern you need a potato slicer with a serrated blade but you can make the plain one with any potato slicer, mandolin, with a food processor or even with a sharp knife. After slicing, the chips should be washed thrice to remove the starch completely and then blanched in hot water. It is preferred to dry them in direct sunlight but you can also dry them inside a room like I did. Try to choose good quality, fresh, white and starchy potatoes – as the quality of potatoes also effects the quality and colour of the potato chips. Aloo ke papad and Aloo sev. 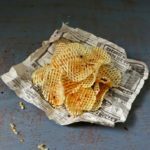 Potato Chips from Scratch – Homemade and delicious! 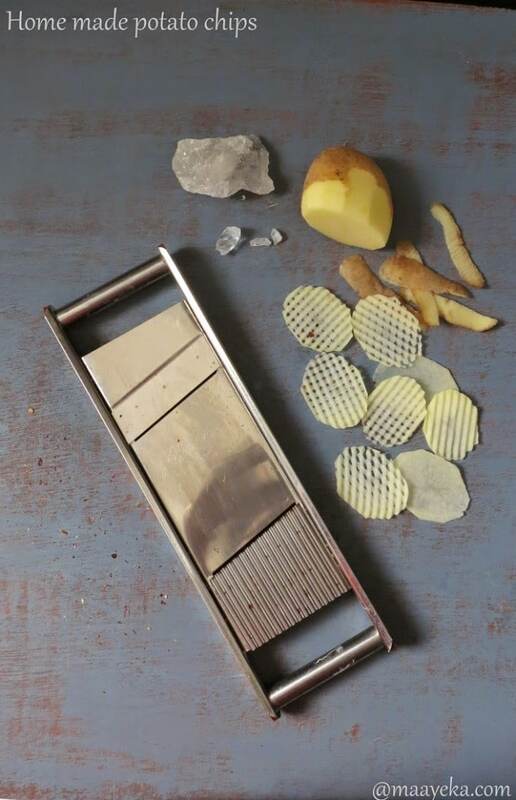 With the the help of potato chips slicer start making chips. For the crisscross pattern you have to use the serrated potato slicer which I have shown in the picture. To make crisscross pattern first you have to put peeled potato on the slicer and then slice a chip by applying slight pressure on it. Then for the next chips slightly twist the potato and make the next slice . So keep twisting the direction of potato after every chips. If you want to make plain chips then you can use any normal potato slicer or a sharp knife. Keep soaking all the potato chips in the water filled bowl in which you have mixed alum for about an hour. When you finished making all the chips then drain the water and wash the chips three times in fresh water so that all excess starch is removed and on your last rinse you will see the water will be clear unlike the prior washes where the water will have milky traces of starch. Boil enough water in a big pan and add some salt (enough to make the water taste salty) and a pinch of alum powder. When water starts to boil add the drained potatoes in it. Drain the blanched potato chips over a colander to drain all the water. 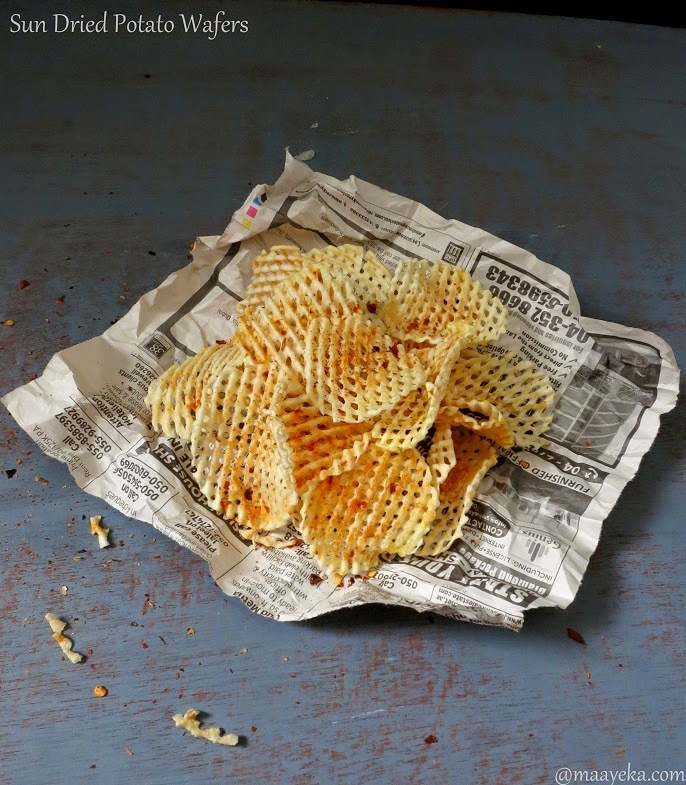 Spread hot chips on a muslin cloth in a single layer,avoid overlapping. When they become dry and crisp store in a air tight jar and use till they last. Heat enough oil in a big,deep and wide pan. When the oil is hot add some sun dried chips and fry on medium heat. Drain on a paper towel to remove the excess oil. Try to choose big, round,white and even size potatoes to make chips. Alum is added to make chips white in colour as some times potato chips turn slightly black after drying.But don’t add too much else the chip may become red while frying. Peeling potato or not depends on your preference ,but I always peel potatoes before making chips. 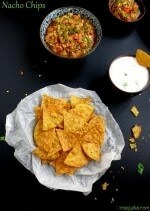 You can add any spice of your choice on the fried chips, you can add dry mint powder, mango powder, black salt, roasted cumin powder, dry tomato powder, chat masala on fried chips to enhance the flavour. Sliced potatoes should be completely submerged in water to avoid discoloration. Some times sweet variety of potatoes makes the chips red so choose a good variety of potato. Adding salt in the water is optional ,you can also sprinkle salt after deep frying,but I prefer to do this way. Superb article. I will try it soon and will share my experience. Thanks for reviving my childhood memories!! We have all grown up taking these for granted, and now that I’m married and in the USA, I miss it! 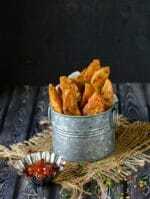 A doubt, Can we bake the dry chips instead if deep frying?? Thanks and regards! Thanks Payal !yes you can bake these chips in oven, you can brush them lightly with oil if you wish. I brought this serrated potato slicer from Indian but you can easily use your mandoline slicer for it. 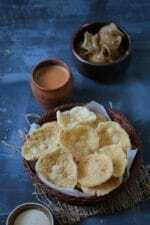 Hi Naumankhan-may be your mother have used too much alum or may be the potatoes are on sweeter side ,so try to get good quality of potatoes to make potato chips. I am so glad I found your site! 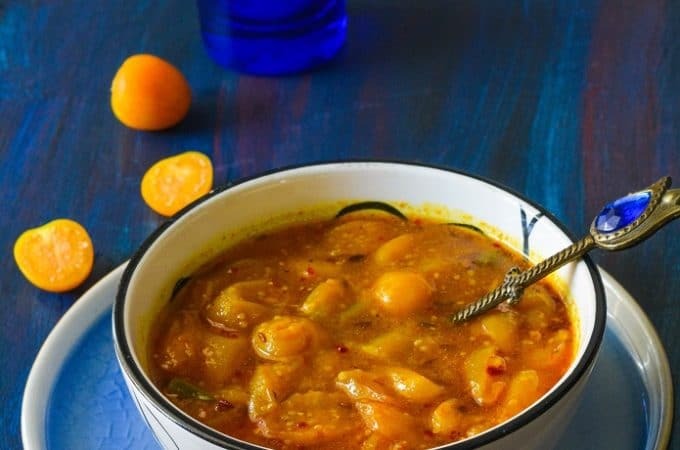 Your blog is absolutely gorgeous – the food and the photography. I went back to my childhood days after reading this post. 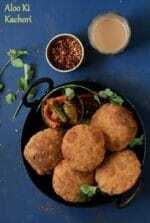 We little girls used to roll out small pooris from the loiee and the aunties used to roll them big and thin.There used to be so much of chatting and fun. It also reminds me of Khicha papad. pls post the recipe for that too. I love these chips but have not made them for a long time. After reading this post I want to make it this summer.